This captivating book simply and engagingly captures the vital role forests play in combating the effects of climate change. The reasons for the current and historical demise of the forest are clearly outlined, followed by a fascinating insight into how a forest works to help the local and global environment. The book outlines a solution to global warming that is realistic, attainable, and beneficial to the Earth and her inhabitants. 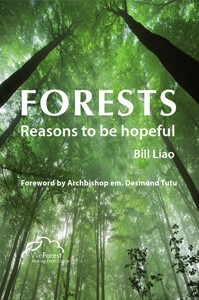 Bill Liao and WeForest’s laudable goals of making the Earth cooler, alleviating poverty, and restoring ecosystems are enshrined in case studies from around the world, vividly demonstrating reasons to be hopeful. Bill Liao is a diplomat, investor, entrepreneur, business mentor, speaker, philanthropist, and author. Bill co-founded the business social network service XING and is a venture partner at SOSV, a global venture capital and investment management organization. Bill is a special diplomatic envoy for St. Kitts and Nevis for sustainable development and the environment. He is also the founder of WeForest.org, an international nonprofit organization combating global warming in the most natural way possible, by sustainably and holistically reforesting previously degraded land. Bill is also the co-founder of the Coder Dojo movement to assist young people to learn how to program. Bill is dedicated to the vision that businesses and enterprises, both commercial and social, and conducted fairly and with respect for the environment, can and will create a better environment for work, life, and the world that we all share. This vision is captured in his book: Stone Soup – a Secret Recipe for Making Something from Nothing. Events and organisations he has spoken at include TED at Long Beach California, The Globe Forum in Stockholm, Sweden, The London School of Economics, and many others.